Images and content courtesy of Architects: Denton Corker Marshall Pty Ltd.
We are proud to announce that G.James will be manufacturing the futuristic glass and aluminium façade for the University of Technology (UTS), Sydney Faculty of Engineering and Information Technology building. This challenging assignment will add to the growing list of landmark Australian buildings which G.James has contributed to. G.James will manufacture the curtain wall, window wall and distinctive aluminium sun shades for the project. Manufacturing of the façade will commence in October 2012. 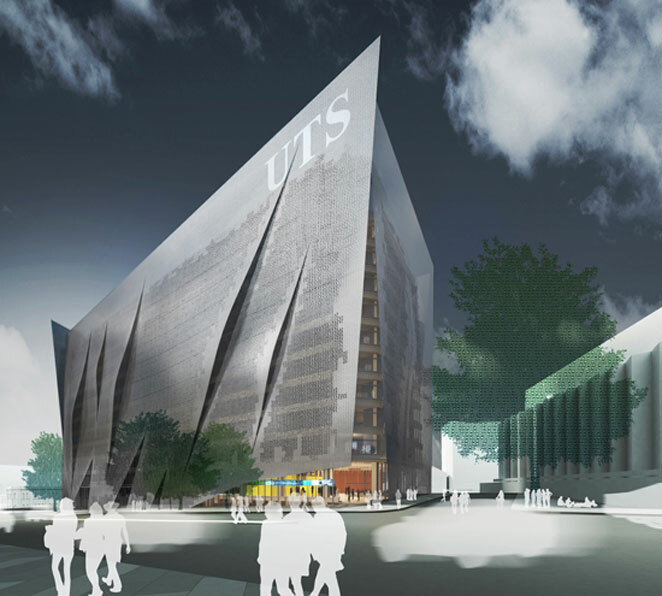 The UTS Broadway is a part of the UTS master plan to redefine the Ultimo campus and will house the Faculty of Engineering and Information Technology. The design of the structure will add twelve levels of teaching & research laboratories, extra lecture theatres, seminar rooms and academic offices, while leaving ample pedestrian access through the ground level. The surface of each plate is creased to form a series of ‘gills’, visually reinforcing the sense of plate as skin and creating a semi-transparent screen. Further permeability is established by perforating the skin of each plate. Using the ‘1’s and ‘0s’ of binary code, the alphabetical character string for ‘University of Technology Sydney Faculty of Engineering and information Technology’ is translated and re-worked to create a perforated pattern on the skins. The 14 level construction will be the first 5 star green rated building on campus, and has a focus on environmentally sustainable practises. The design is intended to reduce energy requirements by 30–45% with features such as night purge ventilation, an under-floor air distribution system, and the iconic binary sunshade. Daylight and fresh air are utilised to reduce dependence on air conditioning and artificial lighting. Demolition, which included the removal of three existing buildings to make room for the structure, was completed in October 2010. Excavation for the building has now finished (over 60,000 cubic metres were removed from the site), and the first footings have been poured, as well as concrete for the car parks. The project, expected to cost $170 million, is scheduled for completion at the end of 2013. In July 2009, UTS announced the winning design, submitted by Australian architectural firm Denton Corker Marshall, from over 60 international entries. Selected by UTS representatives, the City of Sydney, and the New South Wales Department of Planning, the design for the Information Technology and Engineering building was chosen for its aesthetic appeal, as well as its functionality and sustainable qualities. This entry was posted in Aluminium, Facades and tagged Curtain Walls, Design Engineering, sun shades, Window Walls. Bookmark the permalink.